UBC Okanagan nursing student Liana Klohn listens to chest sounds produced by Stan, the School of Nursing's new Human Patient Simulator. Call him Stan the man, but don’t call him a mannequin. The newest tool in nursing education at UBC Okanagan is a complex, computerized human patient simulator (HPS) — a high-tech human replica nicknamed Stan (for "Standard Man") who not only blinks, speaks and breathes, he responds like a real person to drugs and other treatment. "This is the next big step in preparing nursing graduates who are ready for today's increasingly complex health care settings," says Dr. Joan Bottorff, Dean of the Faculty of Health and Social Development, during an announcement at UBC Okanagan Friday morning.It's the first HPS system of its kind in the Okanagan and among the most advanced simulators in Canada. 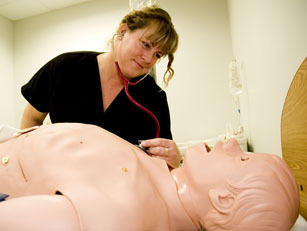 Stan can simulate a male or female patient, has a heartbeat and a pulse that can be checked just about anywhere and, depending on the instructor's settings, accurately mirrors human responses to many procedures such as intravenous medication, cardiopulmonary resuscitation -- even the insertion of a catheter or chest tube. Although it doesn't replace hands-on clinical experience for nursing students, the human patient simulator does offer a risk-free opportunity for students to experience procedures and medical conditions that might not present themselves during a student's clinical practicum in a hospital. "The patient's status changes in real time," says Dr. Joan Bassett-Smith, Director of the School of Nursing. "With this simulator, nursing students can work through scenarios in a safe environment." Nursing Professor Marjorie Wright explains that sessions with the simulator are recorded on video, allowing students to review what they've done. "That's where a lot of the learning takes place," says Wright, noting that the system can model a great variety of patients – whether it's male, female, young or elderly. "Each scenario takes about two hours, and no two scenarios ever have the same outcome," she says. The system cost approximately $110,000 including a computerized curriculum. It was purchased with lab equipment funds allocated to the School of Nursing when it became part of UBC Okanagan. Additional simulators, including the equally sophisticated and similarly priced baby model, would be welcome, says Bassett-Smith. "We'll have 400 students trying to get access to this one," she says, "so we are already looking ahead to acquiring a second human patient simulator."